Explosions and heavy gunfire heard as security officers engage suspected terrorists on Wednesday morning inside Grosvenor Hotel in the Dusit office complex. 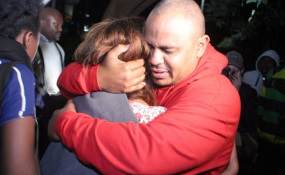 This comes after more than 50 survivors of the attack were successfully rescued and reunited with families who had been camping outside for more than 10 hours. At least four ambulances were seen leaving the compound with the injured.